VATICAN CITY (CNS) — As the celebration of Christmas draws near, the plight of the Holy Family calls to mind the sufferings of the many men, women and children escaping war and persecution, Pope Francis said. Educating young migrants will give them the tools to find “work in the future and participate in the common good as informed citizens. 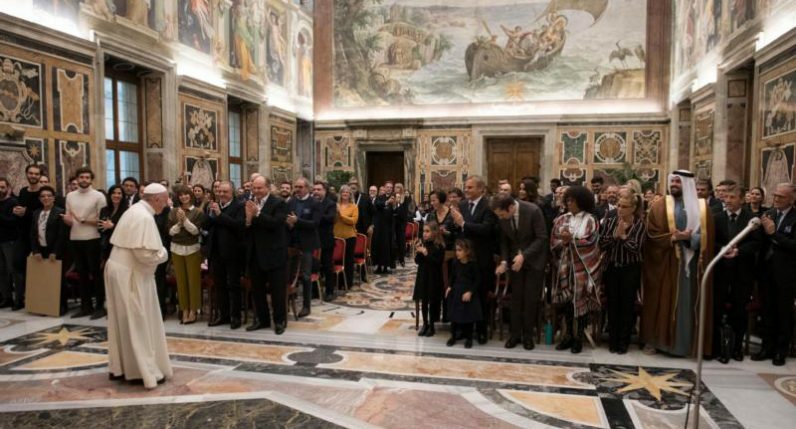 At the same time, we educate ourselves in order to welcome and show solidarity so that migrants and refugees do not meet indifference or, worse, intolerance on their journey,” he said Dec. 14. “The languages of music and art, linked to the Christmas season that celebrates the coming of the Son of God, help to manifest our generous support” for those most in need, Cardinal Versaldi said. Just like many migrants and refuges today, he added, the Holy Father experienced “the anguish of persecution” when fleeing to Egypt. “Little Jesus reminds us that half of today’s refugees in the world are children, blameless victims of human injustice,” the pope said. The pope said that initiatives, like those in Iraq and Uganda, are an opportunity for the church to respond to the tragedies that countless men, women and children face and to offer them a chance not only to receive an education, but also the means for them “to get back on their feet” with dignity, strength and courage. PREVIOUS: English cardinal shocked to learn vicar sent two pedophiles to U.S.